They have a Certification process for new devices as well as different requirements for devices for average surf session. Yep, what am I missing that supports a low grade gps?? This link is in the GPSTC current rule page and is in Bold and does not state ignore the bold link below. They actually have an approval process documented for new devices. There are many GPS products in the market that are superior to the current approved list. They may not supply the end user with SDOP and error data but are no way low grade GPS. If the link is not relevant then remove it from the rules. Below is a University study which shows a good accuracy for what you refer to a low grade GPS.
" When it comes to the precision of the two systems, the calculated Distance Root Mean Square (DRMS) for Garmin and TOPCON were 2.151787 meters and 0.061368 meters, respectively, indicating thus the lack of precise estimation as concerns the horizontal precision of the Garmin GPS. This result for the horizontal precision of the Garmin GPS is directly comparable with the horizontal precision outcomes in the study of Rodriguez-P?rez and others , who also report poor performance of low-cost receivers such as the Garmin GPS." "They may not supply the end user with SDOP and error data but are no way low grade GPS." The GPS-TC is run by volunteers and the Rules pages are updated as often as we can, given this limitation. The linked page on GPS-SS you refer to had changed a bit in recent times, but I see nothing there that is contradictory to our position. It just provides other information and there is some relevant expanation there. But of course, we will endevour to monitor the situation. WE DO have an approval process for GPS's for the GPS-TC. It is well thought out and has been discussed at length with the people involved. It has not been added to the rules page yet in detail, but we hope to do so soon as I have stated recently elsewhere. Your statement: "There are many GPS products in the market that are superior to the current approved list." does not have any qualifiers, context or examples. Consequently, it is meaningless. There are no products 'on the market' that we know of, that have superior accuracy, that is confirmable, and can be validated by Doppler error data. It may be that some products have 'superior', even 'considerably superior' ease of use, longevity, lower price, pretty displays etc, but the essential factor of producing Doppler speed error data is not present, so they can not be 'superior' for our needs. The GPS-TC are in the process if trying to aquire the two new entrants (Motion and Gyro) in the market that do have the 'SDOP' data in their output and that do have the other essential accuracy attributes that make them suitable for our use, so that we can confirm them for approval. Just because a GPS does not supply Doppler speed data and Doppler speed error data does not make it a 'low grade gps'. but it does make it unsuitable for our very specific and unique needs in the world of GPS technology. There are either no, (or very few), other sports that use GPS speed data as the whole and exclusive basis for their competition, and whose competition is so close that it needs the confidence in the degree of accuracy, and lack of error, that we do. I am certain that there are many types of GPS devices out there that are of very high quality in many ways, but that are just not suitable for our particular needs. They are just built for a different need, and they likely fulfull that need extremly well. And just to reiterate, our GPS approval process for the GPS-TC includes the requirements for Doppler speed data, and Doppler speed error data. The paper you refer to above is entirely irrellevant to our needs, as it exclusively refers to Positional data accuracy. Those of use who have spent a lot of time researching Doppler speed accuracy have found that there is far less interest in the general GPS community in this aspect, and therefore less scientific literature published on this topic. But what is published is of very high quality. F*** I need a sail to clear my head!!!!!!!! This study looks only at the positional accuracy of the Garmin. It does not look at speed at all. The measured positional accuracy is in the range of 2-3 meters. Positional data often "jump" by this amount or more, for when the tracked satellites change, which happens quite often. A 2-second run at 40 knots is about 40 meters; a single "jump" can distort the speed by 2 knots up or down, to 38 or 42 knots. Therefore, positional speeds cannot be used, and the study is completely useless with respect to speed accuracy. Most, if not all, modern GPS units do not report positional speeds. If you look at positional speed and "doppler speed" in GPSAction Replay, you will typically see a difference. 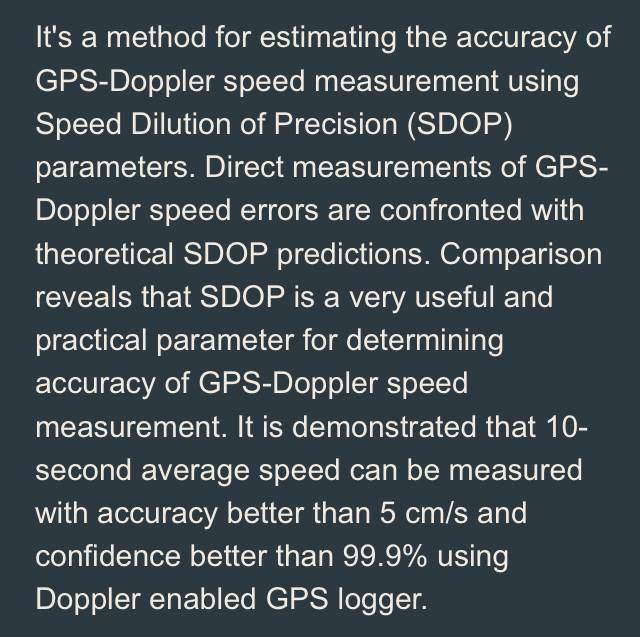 However, that does not really mean that the GPS uses doppler speed - it only means it reports a separate speed number. A while ago, I tested an MTK GPS. The device manufacturer told me it used doppler, and the differences between "doppler speed" and positional speed seemed to confirm that. But when I saw some weird artifacts (>100 knots) and checked back with the company that made the GPS chip, they stated that the device did not use doppler speeds. They probably just used a Kalman filter or similar to reduce spikes from "jumps". Sailquik....you have the patience of a saint. Thank you. A while ago, I tested an MTK GPS. The device manufacturer told me it used doppler, and the differences between "doppler speed" and positional speed seemed to confirm that. But when I saw some weird artifacts (>100 knots) and checked back with the company that made the GPS chip, they stated that the device did not use doppler speeds. They probably just used a Kalman filter or similar to reduce spikes from "jumps". Not one that's widely available. It was made by a small hobby-type shop in the US and looked promising. I later read that the MTK firmware had a bug which may have caused the problems I saw. Or it could have been something else specific to the entire GPS module, not the chip. But the response that MTK chips did not use doppler speeds came directly from MTK tech support. My understanding is all "domestic GPS " are only up to 2-4 m accuracy. result as they still only use the same domestic GPS? Cocky2 said.. My understanding is all "domestic GPS " are only up to 2-4 m accuracy. Cocky2 you are correct that's why the GTC doesn't have a 500m category! At the original 1hz doing 30+kts it could be several meters either way. But you are a bit confused here. SDoP is not used for calculating speed, it's used for an accuracy check, it stands for, "speed depletion of precision". Positional (trackpoint) data has your quoted accuracy, speed derived from trackpoint data is very inaccurate over short distances because of the error you mention. That's why the GTs where a great improvement, they saved the doppler data to file so our divisions could be calculated from that. Positional data is derived from the time it takes radio waves to reach the GPS from multiple satellites. Doppler data is derived from the change of frequency of the received signal from those same satellites, as the GPS moves relative to them. (just like cop's radar). It's great for calculating speed, but can't tell you where you are. The SDoP value looks at the quality of the data, to give a calculation of it's accuracy. The quality of the data can vary immensely with the number of sats in view, and the quality of their signal, just having the gps slip under the arm can reduce accuracy greatly. That's why the SDoP value is so useful, with out it there's no way of knowing for sure how valid any particular result is. That is correct for positioning data. Speed error measured using trackpoints could be up to a few meters per second! Doppler shift is the perceived difference in frequency of radio waves when you are moving towards the source or away from the source. It can be best illustrated by using the example of sound waves. When a mototbike (or aeroplane etc) is moving towards you you percieve a higher frquency sound pitch than when it is moving away from you. You percieve this difference as a change of pitch when it passes you. The same applies to radio waves. If you have two satellites, one directly in front of you, and one directly behind you and you are stationary in relation to those satellites (and for arguments sake lets assume they are stationary in relation to you - which is actually never the case) your GPS would measure the frequency of both radio signals and see them as exactly the same (assuming they are the same transmitted frequency). It would then report that you are not moving. If you start to move towards one and away from the other, the one you are moving towards would now be percieved to have a higher frequency, and the one you are moving away from would have a correspondingly lower frequency. From this difference the GPS computer can calculate your speed very accurately. In practice, the satellites are not stationary, but their exact speed and trajectory are accurately known from constant observation and precision measurement. This data is sent from the satellite to the GPS device constantly, and mathematics are used to calculate your speed. Of course, it is very rare that a satellite would be either directly in front of, or behind you as you move, so the computer has to take that into account as well. To get a more accurate calculation, the GPS will use multiple satellites at all different angles and resolve both your actual ground speed and also your heading from that data. One of the most important factors in the calculation of the Doppler speed error data is the orientation (or constellation) of the satellites used in relation to the direction of your travel. The measurements are inherently more accurate if more satellites being tracked are more in front of you or behind you. (the Dopper shift is larger, and therefore the measurements can be more accurate). If more of the satellites are at close to right angles from your direction of travel, the Doppler shift is smaller and this makes accuracy lower. Satellites that there closer to directly above you will also lead to lower accuracy, and those very close to the horizon will lead to lower accuracy also, in this case because of possible atmospheric distortions (most GPS engines have a 'mask' to eliminate the use of satellites lower than about 20 degrees above the horizon). Ideally, for highest accuracy, you want to be using more satellites between around 30 to 40 degrees above the horizon, and more in front and behind your direction of travel. This is why it is so important for accuracy (both positional and Doppler speed) to have access to as many satellites as possible by using Multiple GNSS (Eg, GPS and GLONASS). In this case there will invariably be more satellites in a more advantageous position for accuracy, and more data for the computer to use to resolve your speed more accurately. Not sure which thread to post in as there is a few on the go right now about the same sort of thing. Without the error data there is no way to disprove a number claimed. There is a post from a while ago in our team that just simply isn't correct but there is no way to confirm otherwise. Decrepit has been over the numbers and we all know the 2 sec is a spike BUT WE CAN'T CONFIRM THIS due to lack of error data. I'm sorry Callan to bring this up again (as it's been discussed before) and it was his first ever post with a Canmore given to him by another team member. So we can all want the perfect device to do what we want but it simply doesn't exist. There are compromises with what we have and the Canmore is a perfect example of why the SDoP is very important and has to exist on our data gathered to prove the number accuracy as best we can with the tools supplied. Anything otherwise is has no relevance. Sad but fact no matter how many hours of comparison have been logged with a Garmin it still only takes one spike to change everything. but it does make it unsuitable for our very specific and unique needs in the world of GPS technology. Why not have a flag in the post for unapproved data loggers ? (ie: a smart phone with a GPS logging app). When a user uploads to ka72 and then GPSTC, they tick a box on the GPSTC post to say they used an unapproved device. The user's results are not included in the team score, but the post is recorded with a symbol to indicate a tainted result, and will allow them get a taste of competing in GPS and interacting with the site (including the banter etc). I have a mate whose been keen to join the GPSTC for a few years now. The stumbling block is the GPS logger. The GW60 faults have scared him off. Plus, his arms are too big for the device anyway. He's is an ex-wrestler - the GW60 won't fit around his wrist !. He wants a GW31 equivalent, but with a bunch of discontinued products on the approved list, plus the GW60, options leave him excluded. 3. I am quite comfortable that the current rules are completely compatible with the philosophy of inclusiveness in the GPS-TC. There is no requirement to officially post your numbers in the rankings. As said, it is more than acceptable to post your numbers (edit: from non approved devices) in the comments for all to see, and to share in the fun. You may be correct that a very few sailors may find even the simplest GPS and computer technology daunting, but I know there are lots of team members who are quite happy to help out with analysis and posting in those situations, which creates yet another oppurtunity for fellowship. When a new team member posts sessions, the team captain should always look at the numbers, since errors in posting are quite common. An 8-knot difference between 2 second and 10 second speed is a big read flag, and should lead to checking the track. The spike in the 2 seconds will be quite obvious, it's probably in a crash or during a swim. In this particular case, the only one suffering from this is poor Callan, who'll have a really hard time improving his 2 second PB. BTW, I have seen similar artifacts with GW-60 data. Many, but not all of them, were caught by the SDOP filter or other filters. Usually, though, the windsurfer posting them looked at the tracks, noticed something was wrong, and did not post the wrong numbers. But these were guys with some experience. This would be so easy to keep everyone happy. There is currently a selection when you enter the data where you can select positional or doppler. This could be added to or changed so that you can select SDOP or no SDOP (even leave is the same, but re define doppler to mean having SDOP and positional to mean not having SDOP). This particular parameter is redundant anyway of people are only permitted to use a Locosys which has doppler by definition. * If someone without SDOP posts suspicious data (or even good data that is in the upper echelon of performance so threatening other sailor results) and the data is questioned by anyone (captain or another team member or from another team), the data is removed and the poster of the data has no right of appeal. Simply they cannot prove the data is accurate so it is removed. Move the burden of proof to the sailor to prove their data is good rather than the other way around. * If nobody has reason to question the data (it makes sense when compared to other parameters like 2S vs 5X10 and is within the realms of the sailors ability and the conditions), it is allowed to stand and contribute to team results. * People can post without SDOP, but changes are made to the inner workings of the GPSTC so that data without SDOP cannot contribute to team or individual result rankings. The data is in the users database but has not other effect on anyone else. It appears in the session results and other team members can comment and encourage. The benefit of this option above posting in the comments is that the user can still keep their own PB lists including kms sailed, and all PBs for their own benefit, but it does not effect anyone else. If the user finds themselves getting good results and the team encourages them to put up real data that can contribute to team results, they may then be encouraged to fork out the $$$ on an approved device so they can contribute. Both of the above options will cause no issue for competitive sailors who are concerned about other sailors/teams getting a competitive advantage due to bad data. In one option the data does not count ever. In the other, data can be flagged and removed if it is causing a competitive issue. The benefits of both options are that they are INCLUSIVE which is what the GPSTC claim is their philosophy. These changes will attract new sailors who are currently interested but not wanting to buy another expensive device, and the inclusion may encourage them to buy the correct device later because they enjoy it. This will also allow existing members who are not competitive and do not wish to buy an approved device that they do not like to continue to be included without rocking the boat of those who are competitive. I just can't see a negative to this approach other than a small amount of work to implement it. Firstly I did personally not want to raise this issue however as others have I thought some may be interested. This track was reported to GPSTC and the response received was far from acceptable based on the endless discussion about data accuracy. Will have to disagree with Martin's comment about you can not verify a track without SDOP error. improving his 2 sec peak due to this obvious data error. We all remember PB fever while learning. "Starboard Atomic 104LFirst ever GPS entry, thanks Jaym for the free canmore"
Myself along with other team members were more than surprised with the 2 sec speeds for the gear used and experience of the sailor. Results for 2 sec from others on our team with far more experience had less 2 sec on modern speed boards, fins and sails. Both myself and my captain checked file in GPS results and analysed the file below which looks extremely corrupted. Contacted Vando by email to check and he throught the file was full of errors. GPSTC was contacted and they responded and I cannot believe they did not remove the 2 sec as the Canmore obviously was damaged from water which was "verifiable " by looking at data in GPS results. The first issue is that the team captain should have checked the validity of this data as per requirements in Team challenge. Why was the historical data not changed to keep the " integrity " of data? Glyn did send me Callan's .fit file. Yes it was a terrible mess, but the 33kts occurred just before a big crash. Without being there to see what happened, there's no way of knowing if he hooked into a big gust then crashed. It was really up to Callan and Glyn to decide, whether to post it or not, well that was my opinion at the time. I've turned filters off, so the 2s gaps get filled in, but that doesn't change anything else. 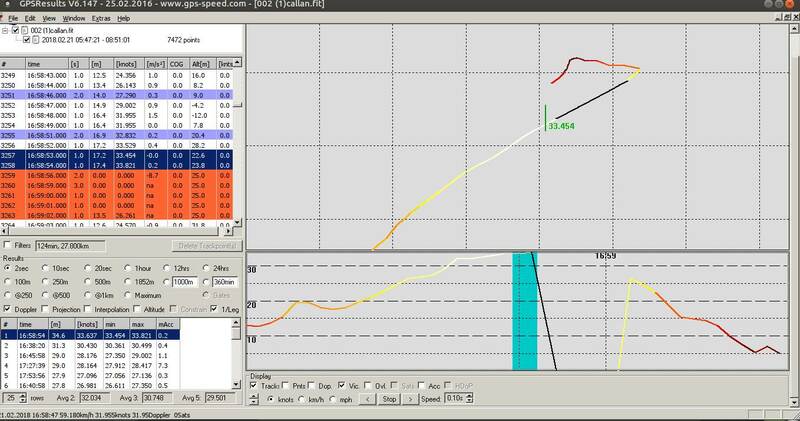 It doesn't look like a spike to me, a smooth acceleration up to 33kts then a crash. As said there's no way of being absolutely sure. The canmore may have been damaged, but Canmores have a reputation for missing data, and if it was worn so it didn't have a good sky view tracks like this are possible with a normally functioning unit. And normally water damage would just kill the unit entirely, not produce erroneous results. So if the 2s should have been removed you can blame me. Ian I think things like this need to be discussed openly and in a proper manner. I know you also have more instances but this track stands out and easy to pick apart BUT as Decrepit shows above how can it be disputed with the data provided? Please explain how you disagree about error data not being valid in my comment. Poor Callan has no idea about the troubles this causes by being new and as you suggest the last thing we all want it to discourage people from our sport. I've made several attempts with contacting Garmin but slowly running out of avenues with them. Not sure what else to do from here. I and many others, if you read all of the posts relating to this topic believe there is a clear desire for more people to be involved. Obviously by the reading the response from sailquick the response is quite simply that there is not going to be any changes made and it you don't like we'll that's ok find something else because we are happy in our little world that we have created. Perhaps people will take the hint and just find something else and that would be a sad day as there is a great community hidden in there somewhere and I have had some great experiences met some awsome people. I wouldn't be the sailor that I am today without the encouragement and comradeship that has been built by being part of a team. Thanks for posting the images. This is a great example of where accuracy data would help. There are several indications that this may be an artifact, but it is absolutely not clear. It may well have been a huge gust with the sailor holding on for his dear life until he crashed violently. The 33.5 knots a full 3 seconds before the crash point that way. On the other hand, this could have been the GPS going into "dead reckoning" mode when it lost reception, which can lead to artifacts that look exactly like this. With accuracy data, that would have been easy to recognize - the error estimates keep going up gradually in such a situation. In a good run, they remain low until the crash. Thanks Cocky2 for reminding me of Callan's file. This is a good example of why the canmore was a mistake, as Peter says, if that file had SDoP, there'd be much less uncertainty. It's also a good example of the benefits of wearing more than one GPS, if he'd had two canmores on, there'd also be much less uncertainty. Well Cocky 2 is correct, that in some circumstances, errors can be picked up without accuracy data, but most of them are eliminated by the processing software's filters. It's the hard ones to spot, like Callan's above where the accuracy data helps. From understanding of the data there is no crash just "orange " for 6 secs or 90m then 26.6 knots. When you untick 'Doppler" there are 2 sec speeds up to 70 Knots and at least 10 over 35kn which tend to mean bad file would it not? I have never seen a Fit file with those gaps all through it where you have to remove filter. I have looked at a couple of hundred at least.